Probably one of the most famous birds, cardinals, had been printed in many basketball jerseys throughout the years. I remember being a cardinal as well. As I became a bird watcher, I fully understood why cardinals are the best type of bird. Aside from their vibrant plumage and beautiful songs, cardinals are easy to please. They can practically be your pet as they remain in your yard when you keep on feeding them. Unlike other birds, cardinals are very loyal. They have been also considered as spiritual messenger. Being such the kind of birds that they are, getting the best bird feeder for cardinals should be put into consideration. There are many ways to take care of a cardinal or a group of cardinals that decided to stay in your yard. One of them is to make sure that they are fed well and housed well. Those are probably the only way you can truly enjoy these red feathery birds. 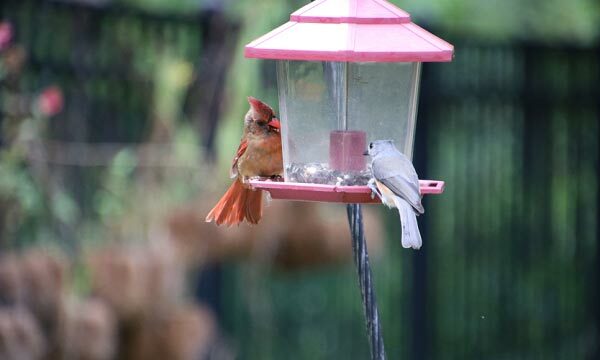 For better tips on which bird feeder is best for cardinals, read the article in full. What is more appealing to these cheeky red birds that a red, no wood bird feeder. It is made of steel mesh beautifully together so it will surely last a long time. It also provides enough space for birds to eat the seeds. Cardinals do perch so providing the No/No bird feeder by Perky Pet provides a covering for the metal mesh, securing it during the rainy and snowy seasons. At the same time, the metal construction will allow birds to enjoy the feeding time without destroying the construction. More than the design, which is awesome, what I love about this feeder is it is easy clean and fill features. It is definitely a low maintenance as the design is so simple, a wipe on top and bottom means easy clean while the lid can simply open to pour in the seed. Of course depending on how high you hang it, there might be squirrels who will come and try to get their share so be careful. Perhaps, the most important thing a birder has to consider is the feeder’s other features such as “is it squirrel proof”, “rain proof”, or “weather proof” in general. So far, a quick answer to all of that will be Roamwild’s Pest Off Feeder. I like the design. That’s the first thing that comes to mind about this feeder. It is main function of feeding the birds is delivered without a problem, but not the durability claim. This is why several birders who have tried it claimed the base part becomes problematic as raccoons or squirrels can get through the thin plastic base by chewing it out until they get through the plastic tube container. However, there are some really great features of this feeder by Roamwild. The feeder can holds at least 2.6 lbs of seeds. It also keeps the seeds dry (well, as long as the raccoons of squirrels don’t get to it first), with its top cap. It is suggested that this kind of feeder should be hung a bit high up in the tree to make sure that the pesky pets that ransacks bird yards will never get near it. While there may be unhappy moments for this feeder, there are plenty of happy ones too. The birds love eating from the feeder’s dispenser. They come so often that you will never run out of birds to watch. Functionality, durability, and clean design. These are the top three features of the Panorama feeder by Perky-Pet that I like a lot. The tray feeling port and the round perch attracts the birds really well. One other thing I really like about it is its capacity. It holds at least 2 lbs of birdseed so its enough for few days, lessening your filling schedule. The wide cap on top of the feeder protects the expensive seeds from the elements such as snow and rain. True to its name, the product provides the best watching experience because of the circular perch. At times, you will have 2 or 3 birds eating at the same time. The clear tube will also gives you the idea when to fill the feeder. What’s more great? The feeder is not only frequented by the cardinals but flinches and hummingbird do come for some seeds as well. It is no wonder why the birders who have tried this product gave it a 5 star rating. It is definitely worth the price. Perhaps, the only downside is that it is squirrel proof. 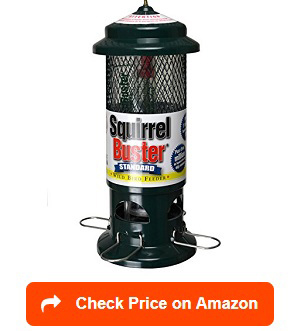 The name says it all: squirrel buster. These pesky squirrels finally found their enemies—the bird feeder made by Brome. This feeder is the most efficient with its price, capacity and even functionality. The company also provides lifetime care to the feeder so it’s a win-win for all. I am recommending this feeder for that reason alone. As much as others, I do not wish to see the raccoons or squirrels in my yard. So having this buster feeder is a good way to go. I love the circular perching features of this feeder. The birds truly enjoy and are relaxed while eating. I get to see few birds enjoying their fill at a given time, which is great. The green color also complements by yard so that adds up to the aesthetic value of my garden. The cardinal ring attracts plenty of northern cardinals, which is the main purpose of having that feeder anyway. At times, other birds do have a way of converging at the perch and share a meal together, giving you the best view ever. This is definitely a must-buy not just because it is functional and pretty for the garden but because it is affordable and heavy duty. You will probably do not need to buy a new one in the next few years. How’s that for a good investment, eh? Squirrel Proof. And for bird feeders, that is a must! It’s pretty in the garden. Yes, this one is important too! Yes, perky- pet is definitely one of those reliable companies when it comes to birding. Their 338 Squirrel Be Gone product is a must to have if you are suffering from frustration because of the squirrels that continuously attack your bird feeders. This beautifully decorated bird feeder, in house design, is the perfect answer. I like it because it completely blocks the squirrels out. It is well made that there is no way squirrels can get in. The perching area is way too narrow for the squirrels to stand on even with their tiny paws. I love this product because it just made things easier for the bird watcher – removable roof peak with lock, adjustable spring, and its beautiful colors – perfect to accentuate the green garden. It is like getting your very own Christmas trinket. Also, it has provisions to either mount it on a pole or hang in. The choice depends on one’s aesthetic preference. There’s more to it than being sorry to squirrels. I recommend it because it features a perch bar that closes when not in use hence deterring squirrels from even trying. You can’t get what you can see, isn’t it? Access to the feed supply is therefore not possible. It works for birds only. Yes, the springs are adjustable to accommodate different bird sizes, controlled by humans. So you can have cardinals and more in your garden if you want to. This may not be very original in design but it does the work and it does it perfectly fine. It is very beautiful too. 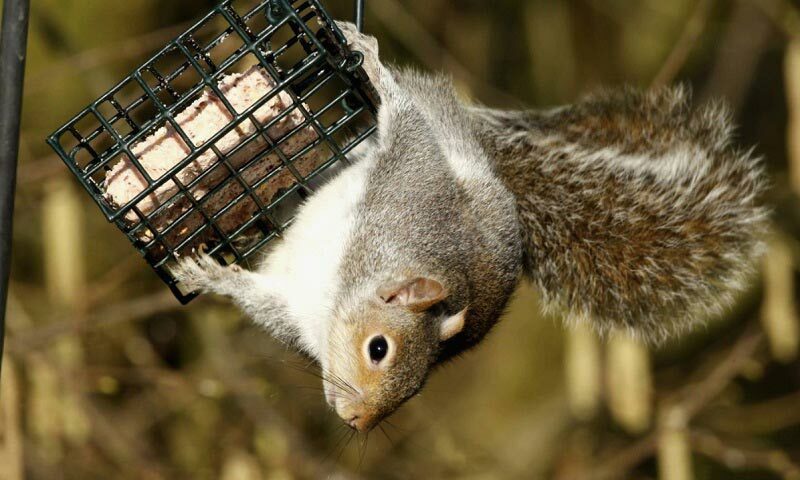 Owning one squirrel buster is enough to teach the pesky squirrel a lesson – never to mess up with your bird feeder ever again. This useless attempt to ransack the bird feeder is deterred by this squirrel buster made by Brome. I like this product for few other reasons: lifetime guarantee for the product itself and squirrel proof guarantee. 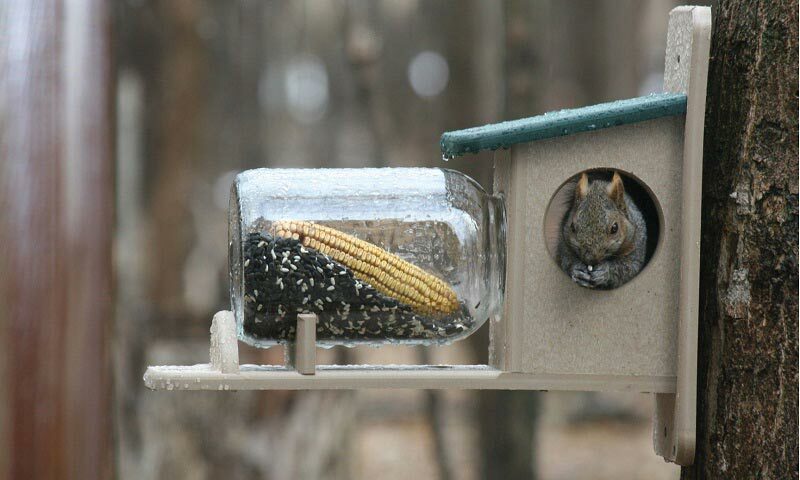 This happens because the weight of the squirrel is enough to let the feeder close the lid that dispenses the seeds. We all know that squirrels have strong incisions, which allows them to damage any plastic without so much hassle. This Brome product, however, makes sure that it is not going that way. They created a chew proof material that ensures nothings (even rodents) can damage by chewing. What else? There is no need for complicated installations. The feeder can be dismantled by hand without any trouble or the use of tools. With such design, cleaning and filling becomes ultra easy too! No wonder bird watchers rate this product with 5 stars. Looks like no one can beat that one yet. Even smart squirrels tend to know they can’t get pass through this. What a good way to make sure there only birds benefit from the expensive bird seeds. 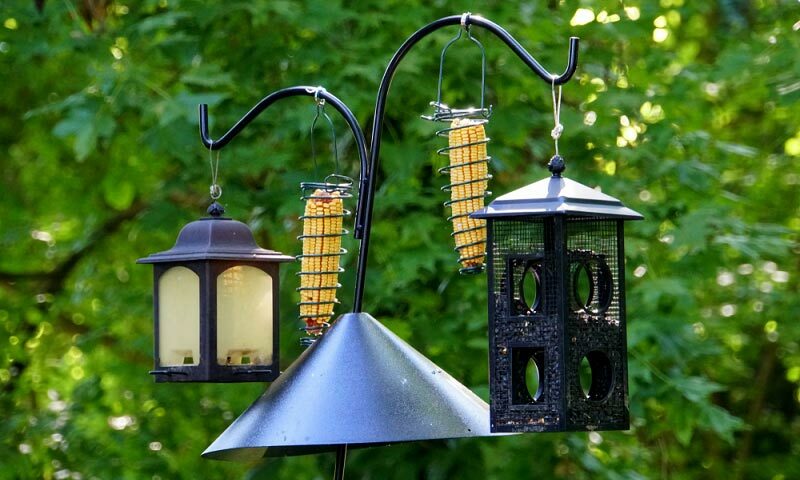 Want to attract more birds to your garden. 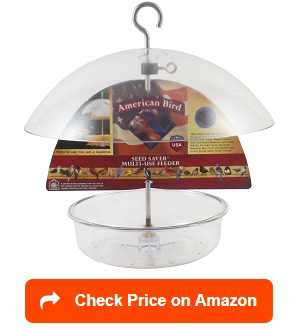 The cardinals will be happy to share the seeds with finches and bluebirds or even blackbirds with this slick bird feeder with crystal clear roof cover. Droll Yankess created this bird friendly feeder without necessarily attracting rodents and squirrels. 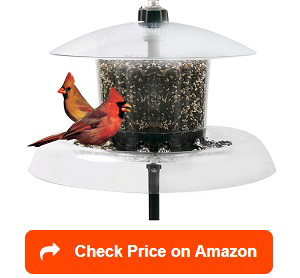 One thing that is great about this product is on how the dome protects the feeder from the elements. The wide dome is adjustable up to 10 inches so you can provide space for birds to perch and eat while you can also close it when there’s strong wind or strong rain. I recommend this feeder for those who do not like cleaning up feeders regularly. It is easy to clean while it’s clear plastic keeps the seeds visible at all times. It is perfect for viewing as well. Droll Yankees did it! Yes, this squirrel proof bird feeder is the most unique bird feeder to date. It is designed with all the elements a bird watcher would love – a perch, a dome, a nice pole and a crystal clear container for perfect viewing. I will recommend this product anytime of the day. It is something I would love to keep in my own backyard not only because it is aesthetically pleasing but because it was all worth the price. This product has the quality most feeders don’t have. It might be a bit costly but it has all the reasons to be. Second, I love that you can refill it without having to dismantle the feeder. Mounting it on a pole means it is within your level upon refill. A pole of about 7.5 feet long will make sure you are either standing or tiptoeing a bit but nothing hard. Third, The perching area that also works as squirrel baffle. Yes, squirrel no more. Droll Yankees did a great job making sure squirrels will never get to the seeds. They can climb the pole but never reach their objective. I recommend this product without a doubt. I think it is the most elegant, most beautiful, most sought after by bird watchers. Want an open feeder? Then this is probably what you need.This woodlink green platform is perfect if you have a throng of birds coming into your backyard. 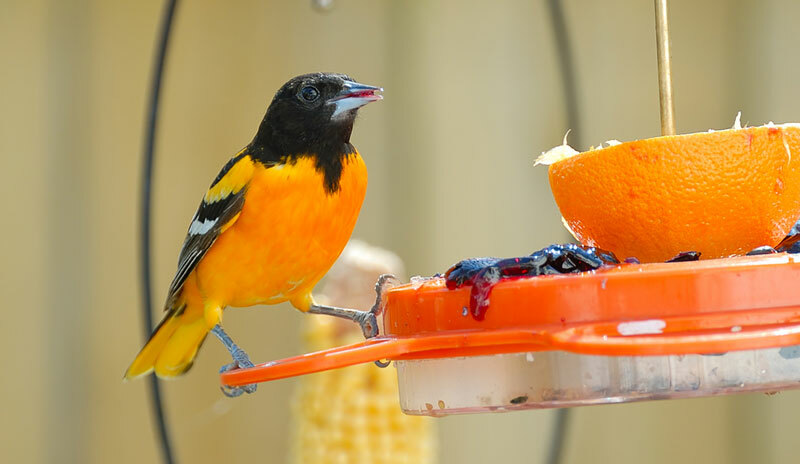 This open feeder will provide them easy perching and feeding while you get the chance to see colorful birds at a go. I like this feeder because it creates a space, big enough for the multiple birds but it could be a problem having to fill it up very often. It’s open system means birds, or even squirrels can come and finish off the food at a time. However, if you are an environmentalist then you will love this one. It is made of 90-percent post consumer recycled plastic so you will be sure to have helped protect the environment. Remember though that it is chewable and your pesky squirrels might come and have a bite when seeds run out. They are pretty good at chewing plastics. The open space is great for many reasons but it can be a problem when it rains. The left over seeds might get soaked so putting it under the roof will ensure that you get the seeds for another day. Still, most bird watchers rated it a 5 because of its practicality and functionality. Nature’s Way made it better. 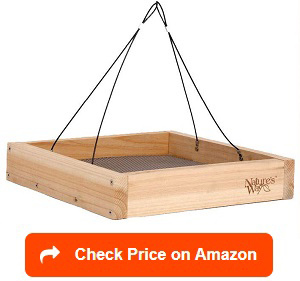 This open space feeder is perfect for the country person. The wood material plus the open draining system is great for feeding plenty of birds one at a time. I like it because it allows the easy filling and less spilling. If you have a number of birds coming in at the same time but do not wish to put up as many feeders, then this cedar platform is your perfect choice. It does the job without too much hassle. Personally, I have always been bias over anything that is made of wood. They just add a lot of character in the yard. 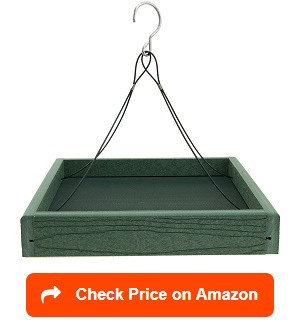 Hence, this feeder platform is perfect for some who thinks that bird feeders could add aesthetic value to the garden. The cedar wood is rot resistant as it is made of premium cedar wood. It is chemically modified to ensure that it is water-based protective stain too. Nature’s Way had it well when they developed it. The design is big enough to fill it up with seeds that are enough for a day or two, depending on the number of birds coming in. By rule of thumb, the feeder should be placed in a space that can easily be seen by birds so hanging it on birds flying level is ideal. I recommend it because it is one of the most practical feeders around so far. Cardinals are fascinating birds. They are very territorial so having their own bird feeder is a must. Bird watchers know that they prefer to feed in more of a closed space, a tactic against predators. If not on a proper feeder, they can be ground feeders too. 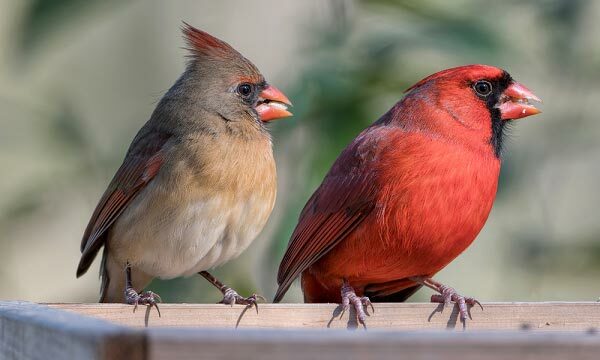 To know which cardinal feeder is right for your yard, you need to know that cardinals actually are the first ones to feed in the morning and the last ones at night. With this in mind, having a feeder that works for such purpose is great. If you have an open space feeder, then that means refilling the feeders twice a day is sufficient. 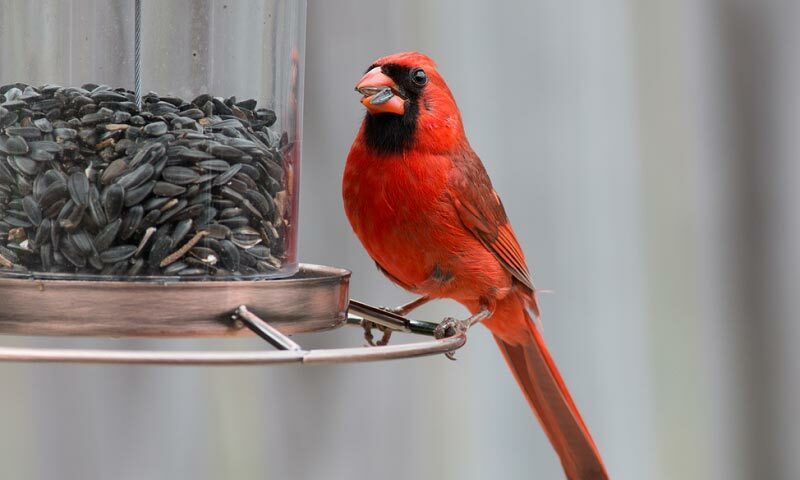 Cardinals know which seeds is good for them so using a proper feeder with the correct mixture of seeds is needed. 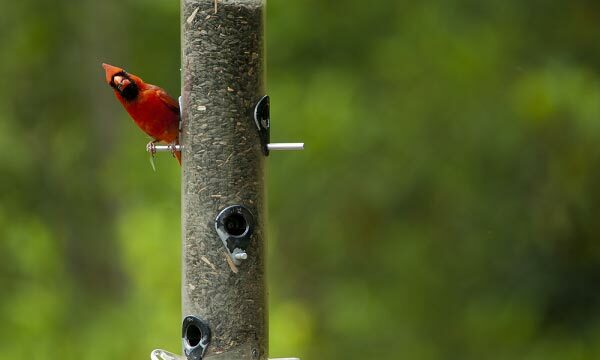 Either way, like any other feeders, the cardinal bird feeder should not be accessible to squirrels and rodents – the biggest enemy of any bird watchers. Like any other birds, Cardinals know what kind of food they want. They have special characteristics that dictate the kind of food they prefer. One of which is of course flowers seeds such as sunflower. If you are attracting cardinals to your garden, remember that they respond to sunflower seeds without much hassle. 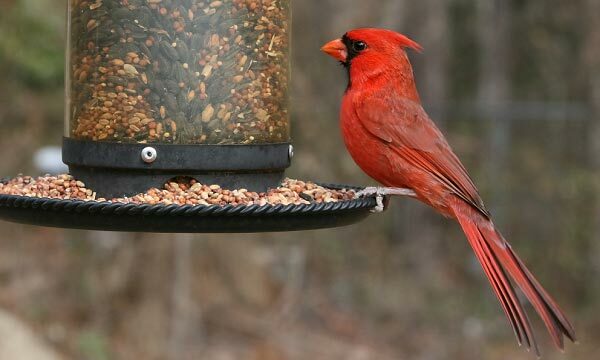 Putting this seed in an accessible feeder therefore ensures that you get your first colorful cardinal visit in no time. Wagner’s cardinal blend is the perfect example of what this bird specie is looking for. It is from 60% sunflower seeds and 40% safflower that are perfect for northern cardinals. When it comes to cardinals, you’ll never go wrong with sunflower seeds. Well, there’s an added bonus to feeding them safflower – squirrels do not eat them. This means that your money’s worth goes to the bird of your choice. Wagner’s idea of combining in this big bag is great. When not in use, the container is Velcro locked so the seeds are kept safe and fresh until the next feeding. Yes, cardinals are one of the most loved bird variety. It is no surprise that they have their own birdseed type. 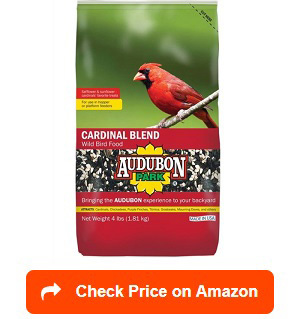 This Aududon Park cardinal blend is just one of the many kinds but surely a good choice. 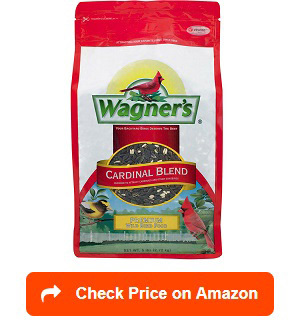 For cardinal fanatics, this bag of 4 lb blend rich in sunflower and safflower seed is your go-to product. Well because it is so good, it does not limit itself to cardinals only but also welcomes chickadees, finches and even mourning doves. You get some of the most tantalizing birds with just one kind of birdseeds. How good is that? Personally, I love this product because of two reasons: it is cost-efficient and loved by many birds. Also, a bonus that you can put it on tray or a tube feeder is another thing. It is always great to have choices. While there are many good points, there are few flaws (a) the sunflower content is 60% and safflower 40%, making an unfair distribution. It means plenty gets thrown into the ground by birds who does not like eating either of the two. Being territorial birds, getting the best feeder is a necessity. If you intend to attract cardinals among the many types of birds, be ready to provide feeders that focuses on their needs. It is not a surprise that most people would choose Northern Cardinals as it is one of the most beautiful birds you can find. Perch,eat, sit. Yes, Cardinals are shy birds so they normally stay in one feeder for the entire feeding season. Providing a feeder that allows them to comfortably eat the seeds is excellent. 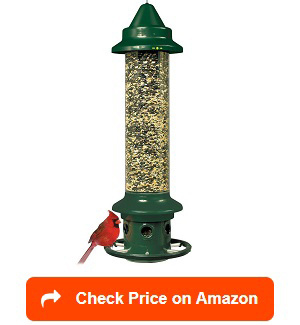 Cardinals usually ranges from 7.5 to 9.25 inches so getting a feeder that can accommodate this is ideal. Tube Feeders, not. As much as possible, you consider space when feeding cardinals. Tube feeders usually have very small holes for seed dispensers. This will deter Cardinals from eating enough or even enjoying the feeding time. Seeds for Sunflower. 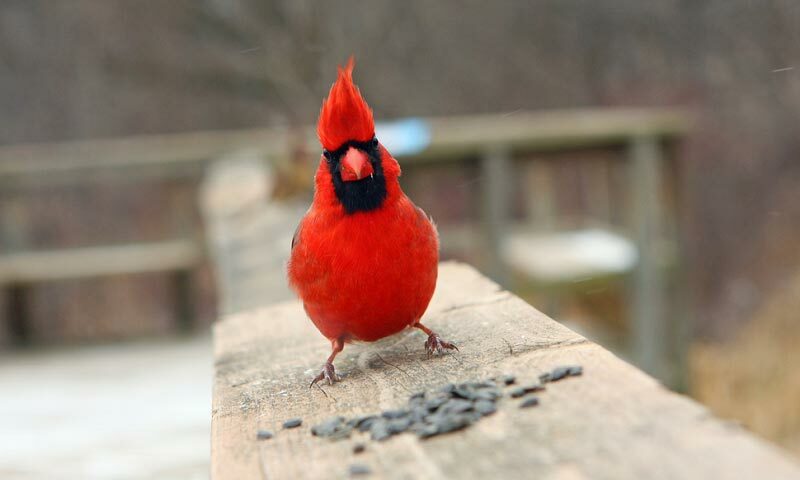 Cardinals love sunflower seeds. They have very strong but relatively large beak so sunflower becomes an easy and favorite seed of choice. Putting such seeds on a mesh might be a challenge for the Cardinals. Open Feeders. Get a feeder that is wide enough, more open for easy access. Cardinals eat slow and long so it is great to provide them with enough space to perch and eat comfortably. 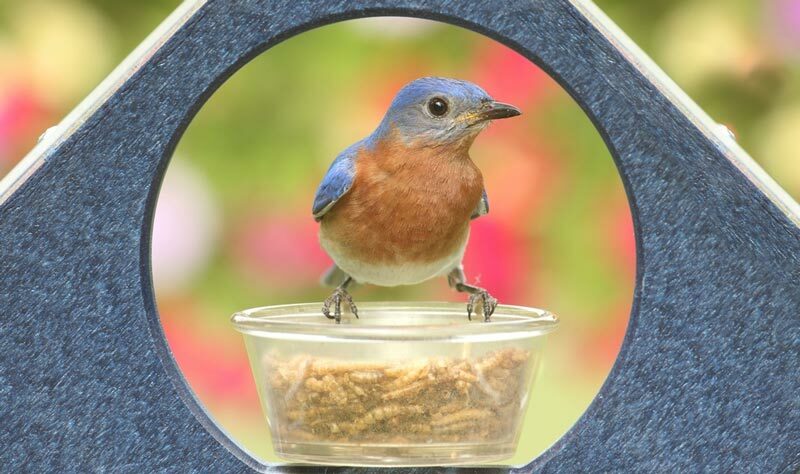 Certainly, getting the correct feeder is the first step in making sure the bird watching experience is going to be colorful and fun. Sometimes we ask ourselves why do we do what we do? Bird feeding is certainly one of those few things you can do while doing something else. Waking up to the sight of birds perching, sitting and feeding in their glorious colors is psychologically appealing. Health. A study conducted shows that Northern Cardinals “are much more than scenery and a soundtrack” but they also play a very important role in maintaining human health. While robins can spread diseases such as West Nile Virus (WNV) to humans, Cardinals do have the opposite effect. They deter the presence of it prompting scientists to conclude that they are “super suppressors” of the virus. The researches concluded that bird biodiversity is important to ensure healthy human population. Aesthetic. Birding does not only bring in beautifully colored birds, they also bring in peace and harmony in the backyard. One of the most enjoyable sound the human ear can listen to is the sound of chirping birds. Coffee and birds chirping, who does not like that? Nature up close. Cardinals are territorial birds but they can always form their own group while you enjoy a diversity of birds in to your backyard. One good thing about cardinals, unlike others, is that they will always come back to the habitats they have previously marked as theirs. 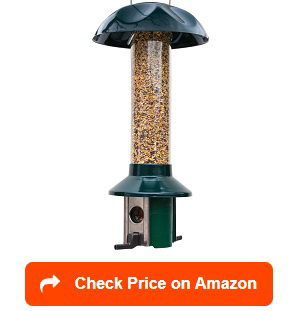 So provide a good feeder and you’ll never lose them again. 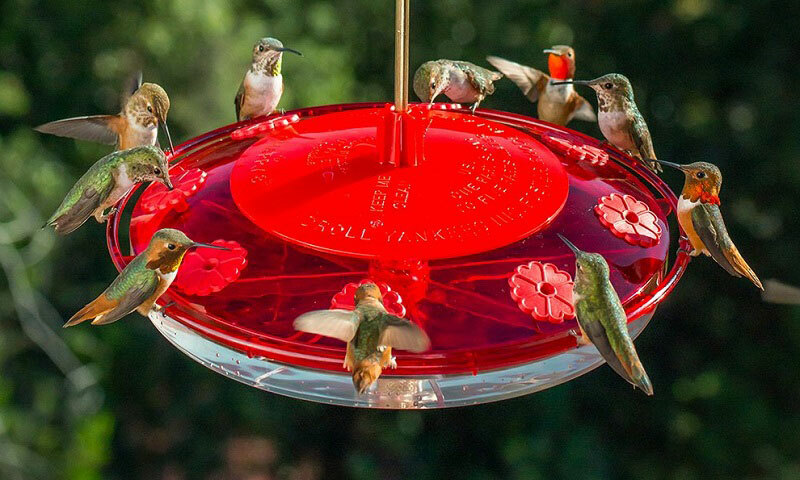 With so many choices around, it is pretty hard to find the perfect feeder. Here are few factors that you might need to consider before making that purchase. Cardinals like to eat comfortably. This means that one of the consideration will be buying bird feeder that has provision for perching and sitting. Mesh wires are probably out of the question to attract cardinals. Platform feeders. Cardinals are also ground feeders. They are good at foraging food so having a platform feeder will be more friendly to the cardinals both on the feeder and on the ground. Seed container and dispenser. One of the unique traits of cardinals is the fact that they do have very strong beaks to open seeds like sunflower and safflower. It however means that they need bigger container for them to enjoy their food. In which case, the capacity of the container as well as the size of the dispenser is to be considered. The bigger the better. 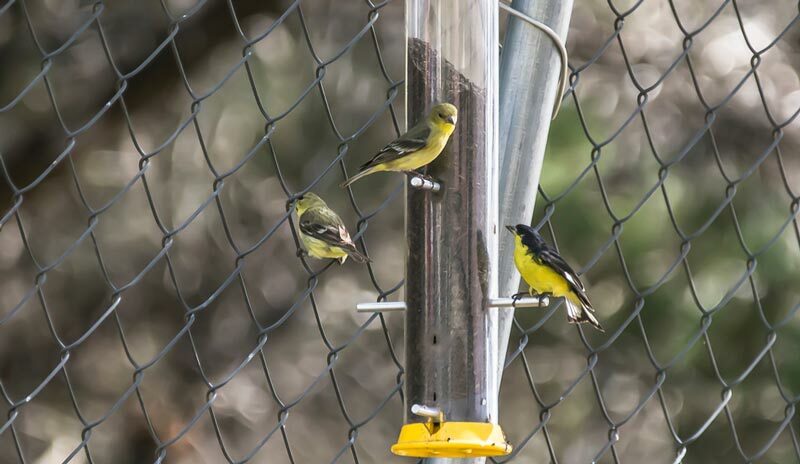 Each variety of bird responds to feeders differently. Knowing the characteristics of the birds you are trying to attract, in this case, the cardinals mean that you will be able to choose the best cardinal bird feeder you can find in the market. Where to buy a Cardinal Bird Feeder? 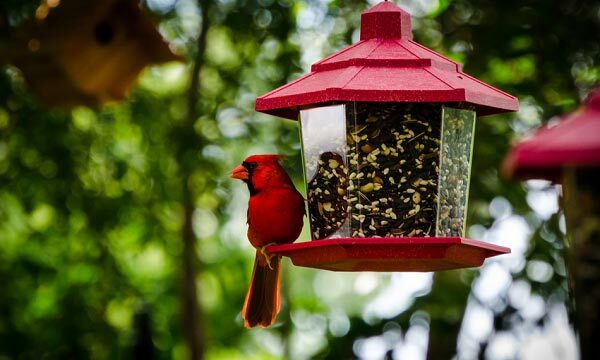 Buying a cardinal bird feeder can be tricky as the same type can be sold in different prices depending on location and medium. Most of the time, online shopping sites are always cheaper making Amazon.com the best place to get some. 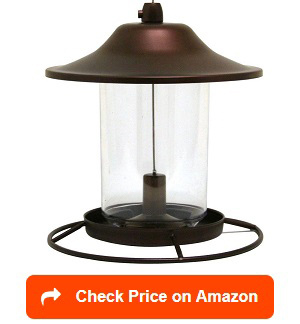 Online bird feeder shopping will also save the buyer time to go to the shop and spend money on gas and time on travel. 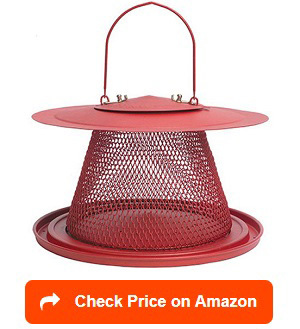 With technology today, amazon.com probably is the best place to go for any bird feeding needs, including quality bird seeds and feeder cleaning tools. For the traditional ones, your nearest Walmart is a great place to start. You can physically inspect the product and decide which one best suits your garden. This also means no waiting time and no worries about possible delays or shipping damages. Much like Walmart, Home Depot offers you all ranges of bird needs. 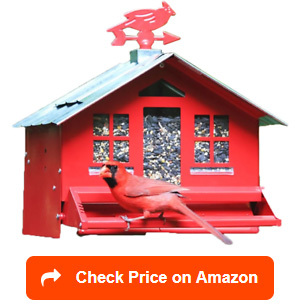 You can pick up the perfect feeder for cardinals in accordance to your backyard design. It is always a delight to have that personal touch when beautifying your garden. Where to hang Cardinal Bird Feeder? Without a doubt, cardinals are a wonderful addition to any garden. This is specially true during the winter wherein you get to see a strong contrast of their red color with the white snow. Natural Places. Cardinals do not nest in nesting boxes like near thick trees or shrubs. Seeing thick greens will provide them the illusion that they are in their usual habitat in the forest. 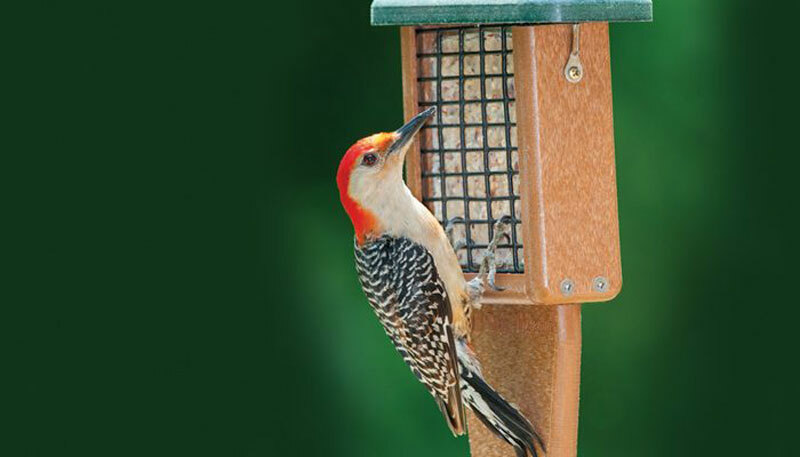 Hang your feeder on a tree or install a pole near a forested area. Bushes. A trick you can do when your yard is nowhere near a forest is to put plants together and install the pole right in the middle of it. It creates an illusion of thick bush and will attract cardinals to come over easily. Free of Chemicals. Place your cardinal from areas you normally use pesticides or herbicides on. Deadly poisons for plants are deadly to cardinals too. 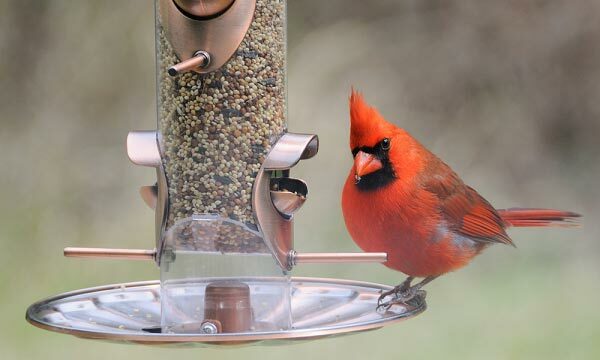 This is especially because some of the most functional cardinal feeders are open feeders. Are Cardinals in my area? This question should have been asked in the beginning. Before you start your buying spree, ask yourself whether or not you or your neighbors have spotted plenty of cardinals in the area. Northern Cardinals live in the northern part of America and Canada. While there has been several migrations to other places, the number of cardinals may not be enough to visit all of the feeders around. If you live near a forested area, chances are you get plenty of cardinals. This way, you should go on and hang that feeder. Attracting this territorial but shy bird is no easy matter. There are few things you can do to make sure that they will come visit your yard hours after you install your cardinal bird feeder. Make your yard attractive. Make sure that you know when cardinals are coming and going. They come in the morning (the first feeders) so make sure you got all greens, water and seeds ready before they come. Water. Placing a bird bath few meters away attracts cardinals faster. They are smart enough to know a yard is bird friendly or not. Preparation is the key. Nesting places. They are typically forest birds so getting the feeder as close to the forest or thick greens as possible creates trust between the cardinal and the birder. A more natural habitat is encouraged. Among the many bird species, Cardinals are the easiest to please, to attract and the most beautiful during the summer and the cold months. Keeping them into your backyard will ensure that you have a steady stream of beautiful birds and bird songs all throughout. Among the many things that need doing, choosing the best bird feeder for cardinals is the first step. Happy birding!